West’s Josh Berry looks for a cutback lane against Wellston. West’s Cole Staggs attempts to dodge a tackle toward the near sideline against Wellston. 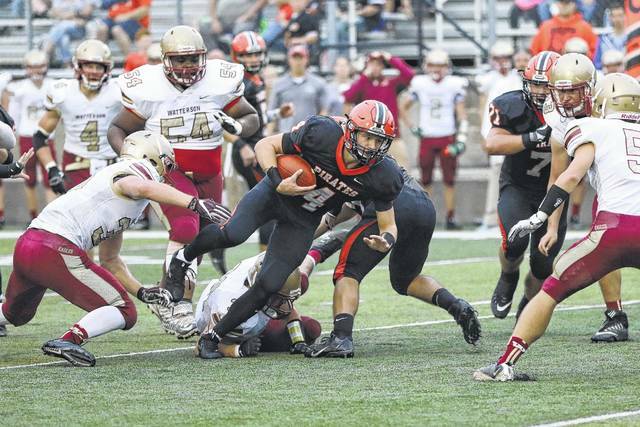 Wheelersburg’s Cole Lowery fights for yardage against Bishop Watterson. COLUMBUS — In any football program, it’s always important for said program to stick to the script. Over the course of the 2017 campaign, the Wheelersburg Pirates, the West Senators, and the Waverly Tigers have all done just that, which explains why all three units are 4-0 and are ranked in the latest version of the 2017 AP Ohio Football Polls that came out on Monday evening. Of those three units, it was Wheelersburg who made one of the biggest statements in recent memory as the Pirates clobbered a traditional powerhouse in Columbus Bishop Watterson by a 47-17 tally to move its overall scoring margin to a whopping 173-26 as the regular season hits its midway point this week. The Pirates collected an astounding 525 yards of total offense against Bishop Watterson and held the Eagles to 244 yards of total offense as Wheelersburg’s run defense continued its outstanding work by holding Bishop Watterson to 69 yards on 25 carries. 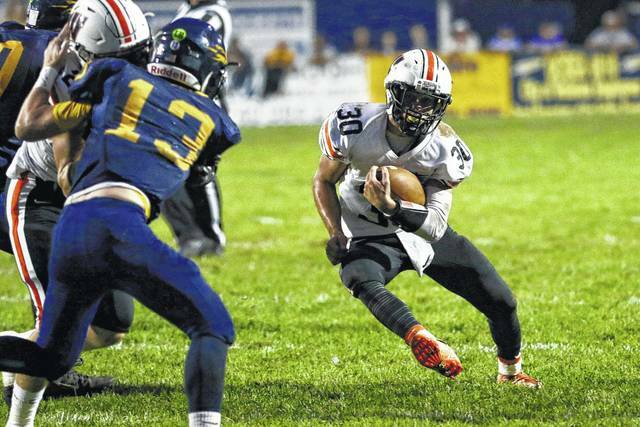 As a whole, the Pirates’ defensive unit has held its opponents to a stout 141 yards rushing on 105 carries on the ground (1.3 yards per carry) to put Wheelersburg’s defense in a class of its own in Division V.
Offensively, Trent Salyers — who collected 356 yards passing in the first half of play against the Eagles — ended up completing 19 of his 26 passes for 417 yards and four touchdowns in less than three full quarters of playing time. Tanner Holden collected 208 of Salyers’ passing yards and three of Salyers’ passing touchdowns on his own en route to collecting 10 catches, and collected a 59-yard interception return for a touchdown to boot in capping off the game’s scoring. For the year, Salyers has collected 1,149 yards passing and 12 touchdowns to just four interceptions (a 3-to-1 touchdown-to-interception ratio), with 29 of his 56 passing completions going to the 6-6 junior standout in Holden, who has amassed an astounding 641 yards receiving and 10 touchdowns (24.7 per catch) on those 29 catches. 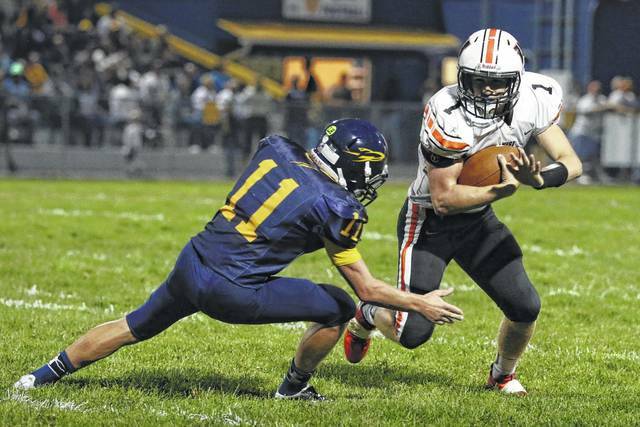 Defensively, Wheelersburg is led by Evan Dahm and Avery Donini, who have collected 19 tackles apiece for the Pirates. Xander Carmichael (18), Nic Parsley (16), Bryson Keeney (15), Makya Matthews and Evan Horsley (14), Josh Henderson (12), and Justin Salyers (10) have each collected double-digit stops for the Pirates’ defense, who has also had 41 players make at least one tackle on the year. Overall, the Pirates still sit in fourth place with 168 total points — but collected a massive 59-point uptick from the previous week while maintaining all four of its first-place votes. Pemberville Eastwood (225, 12 first-place), Canfield South Range (207, seven first-place), and Anna (175, one first-place) are the only Division V teams who sit ahead of Wheelersburg as of this point in time. After allowing just 38 points over the first three weeks of action against Fairland, Portsmouth, and Coal Grove, the West Senators’ defensive unit continued to show its dominance against Wellston as West handled Wellston, 31-6, to move its overall scoring margin to a stout 111-44 in its own right en route to obtaining 90 points in the latest Division V poll (a 28-point uptick from the week prior) while improving two spots. Behind a defense that has bent, but failed to break, West has ultimately proven to have a defensive unit that can compete with anybody’s as the Senators have held the Dragons, Trojans, Hornets, and Golden Rockets to an average of 11 points per affair. Their efforts, plus an effective ball control offense that includes Dylan Bradford, Garrett Hurd, and Josh Berry, have allowed West to establish a plus-six margin in takeaways in 2017. Overall, Hurd has led the way for the West offense with 439 rushing yards on 77 carries — an average of 5.7 yards per attempt — in 2017. The junior scatback collected 115 yards and two scores against the Golden Rockets. Berry’s 391 all-purpose yards and Bradford’s 383 yards passing round out a well-balanced offensive attack. Defensively, Berry (38 tackles), Jakeb Guilkey (35 tackles, five for loss), Brandon Weaver (34 tackles, eight for loss), and Gabe Skaggs (33 tackles) round out another impressive, well-balanced defensive unit from Scioto County. In Division IV, Chris Crabtree’s Waverly program, like the Pirates and the Senators, also sit at 4-0 on the season. The Tigers, as a result, are receiving votes in the Ohio AP Division IV Poll (24 points, tied for 11th) behind an explosive offense that is averaging 37.25 points per affair and 440 yards per contest. Clayton Howell, who went an incredible 23-of-27 for 350 yards and five touchdowns in a 46-26 victory over Fairland on Friday evening, has already garnered 1,088 passing yards and 14 touchdowns to just two picks in 2017 while completing 67 percent of his passes. Behind the efforts of Howell, Drew Kritzwiser (604 rushing yards and eight touchdowns), and the receiving trio of Cobe Marquez, Easton Wolf, and Kayne Jordan, the Tigers have put on an offensive display of its own as Waverly has already scored 149 points (37.25 per contest) in its first four affairs.